While most sound bars offer a “virtual surround” experience, the YSP-2500 uses exclusive Digital Sound Projector technology to produce sound beams that reflect off the walls of your room to deliver true 7.1-channel surround sound. The result is an expansive and immersive listening experience that brings your favorite TV shows and movies to life. 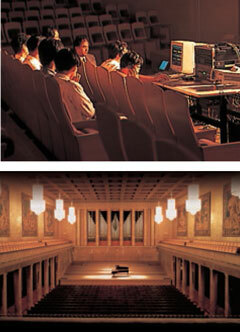 How Does Digital Sound Projector Technology Work? The YSP-2500 employs a high-performance processor to precisely control the timing of 16 digital amplifiers and 16 speakers, creating controlled "beams" of sound. The sound beams are then aimed — either directly or by reflection off your walls — to arrive at your ears from discrete, channel-appropriate directions. Whether you‘re watching a movie or sports, or just playing some music, the YSP-2500 offers a variety of ideal listening modes. For late-night, when you don‘t want to disturb others, a special target playback mode points the sound to a single location or you can connect to the front panel headphone jack for an immersive surround sound experience. Play music wirelessly from your smartphone or tablet. Supports aptX® for superior sound quality with compatible devices. In addition, a Bluetooth standby mode provides the convenience of having the YSP-2500 turn on and off automatically. Ultra-sophisticated Yamaha CINEMA DSP Digital™ technology re-creates the sound fields of some of the world’s most famous performance venues. Select from 10 different settings for your listening preference. CINEMA DSP Digital programs are created by recording actual sound field data in performance spaces around the world and then applying ultrasophisticated digital processing. Yamaha was the first, and is still the leader, in providing this truly amazing, realistic surround sound experience. The YSP-2500 decodes HD Audio signals to ensure that you hear the best possible sound from Blu-ray Disc™ players, as well as from all other digital sources. When music is encoded into a digitally compressed format like MP3, the frequency response suffers. This function restores what was lost, so your music always sounds the way it should. The YSP-2500 stands at a mere 2-7/8" high with the feet installed and only 2" without. The super-slim design allows you to place it in front of a TV without blocking the viewing area of the screen. It is also wall mountable with the SPM-K20 (optional) bracket. The 130 W active subwoofer offers a rigid body construction that reduces unnecessary resonance to produce rich and solid bass. A circuit board with an intricate grounding scheme ensures stable current supply. And, because there is no need to connect cables, your wireless subwoofer is easy to setup and place – either vertically or horizontally. With an aluminum front and top panel, the YSP-2500 is designed to prevent unnecessary vibration to ensure the best sound clarity. In addition, the internal structure has been precisely calculated and systematically arranged, optimizing the layout of the speaker drivers to improve sound dispersion. The result is highly accurate, invigorating surround sound. Download the free Home Theater Controller app for iOS and Android™ to easily perform a variety of functions. 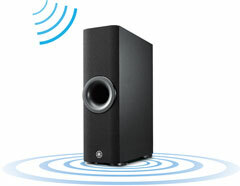 Select surround sound listening modes, Cinema DSP modes or adjust sound beams for the best listening experience. 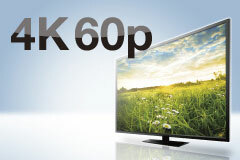 The YSP-2500 supports the latest version of HDMI for 4K Ultra HD 50/60p transmission of super high resolution images. Three HDMI inputs mean you can connect three high quality digital sources, each with just a single cable. 3D compatibility allows the transmission of 3D video. 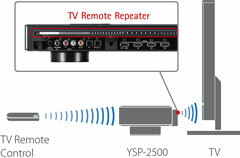 Even if the YSP-2500 blocks the TV remote’s signal, the TV Remote Repeater transmits the signal to the TV so operation is unaffected.